The motor can be gas or electric but if you are putting it in your garage, absolutely do not use a gas-powered air compressor. A gas engine produces carbon monoxide which is a deadly, poisonous gas which is not something you want to have in an enclosed room. You can place a gas-powered compressor outside and run the lines inside but it is still not as convenient as an electric compressor. The motors job is to turn the pump. The pump is responsible for actually sucking in and compressing the air. The compressed air from the pump is then plumbed into a tank which stores the air. There are, of course, many different configurations and sizes of these 3 components which determine the efficiency and cost of the compressor. The tank size determines the physical size of the air compressor. If it were not for the tank, the motor would be running constantly to supply any compressed air. The pump will pump air into the tank until the tank reaches a specified pressure(psi). Once the tank is filled with the specified amount of air, the motor will shut off and will not operate again until the air pressure inside the tank is reduced to a specified amount. 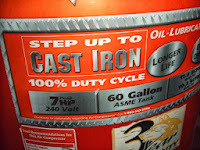 The tank size determines how frequently the motor runs. Another way to word it is, the tank size determines how many air tool related tasks you can do before the motor starts to run. A 5-gallon tank would require that the motor run for virtually every task. For an example, removing one bolt with an impact gun will likely empty the tank enough to cause the motor to run when you have a 5-gallon tank. A continuous air tool like a sandblaster uses so much air, it would empty the 5-gallon tank so fast that the motor would never shut off. You can have the biggest motor and pump in the world, but if it is attached to a 3-gallon tank, the motor will run very frequently, but for a very short period of time. If you have a very small motor/pump and a huge tank, the motor will run less frequently, but each running session will last for a very long time. A good all-around tank size for a home garage is 60 to 80 gallons, but honestly, the bigger, the better. I will fill in the equation using the specs from my air compressor motor. The actual running hp of the motor is probably pretty close to 4.4hp, yet my air compressor has a giant sticker on the front that states 7hp. Manufacturers like to over-rate the hp figure for whatever reason and it is not just the cheap manufacturers. Most of them are guilty of it. Now you will know how to figure out the actual horsepower of your air compressor motor. But again, it is not all that important. The motors requirement is simply to be able to turn the pump and to do so without putting a bunch of strain on the motor. This number is another marketing number. It will be on the sticker in big bold numbers right next to the fake hp number. The psi is a measure of the pressure of the air inside of the tank. A common "Max PSI" for a garage-sized air compressor is around 150 psi. Using the 150 psi example, the motor will run, turning the pump, which pumps air into the tank, until pressure inside of the tank reaches 150 psi. Then the motor will shut off. This number is also pretty irrelevant to your purchasing decision. Along with your air compressor, you will need an air compressor regulator. An air compressor regulator takes that input of 150 psi and reduces it to a psi that you select. I have never found a need for more than 120psi. 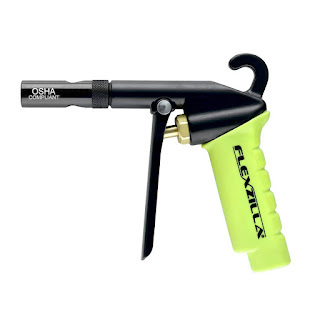 A powder coating gun operates at around 35psi max and sandblasting is usually done at less than 100psi. So as long as the air compressor has a max pressure of more than 100psi, it will work fine. Do not buy one compressor over the other because one states 150 psi and the other states 175psi. This number is very important, if you could only go by one specification when buying an air compressor, this would be the one to use. CFM (cubic feet of air per minute) determines how much air the pump can put out per minute. The higher the CFM, the faster it can fill the tank with air. If you are using a tool that takes more CFM than the pump is capable than putting out, once you use the reserve air in the tank and the compressor starts running, it will run until you stop using the tool and it can catch up. An easier way to explain CFM is this: Your pump is constantly trying to fill the air tank. That is its job. Any air tool that is being used is a leak in the air tank. How much CFM the tool uses is a measurement of how big the leak is. If the tank is leaking out more air than the pump can put into it, the pump will never shut off. If the tool only uses .01cfm less air than the pump can produce, the pump will run 99% of the time. This only applies to continuous use tools however. If you use an impact wrench for 2 seconds, that's only a 2 second leak. A sandblaster presents a continuous leak though. As long as you are holding down the trigger on your sandblaster, it represents a leak. The rule of thumb for deciding how much CFM you need is to figure out what tool you will be using that requires the most CFM and add 3 CFM to be safe. Say your sandblasting gun will be using the most air and it uses 10cfm at 90psi. You should plan on getting an air compressor that can output at least 13cfm at 90psi. If you plan on having someone else use the compressor at the same time, say 2 sandblasting guns being used at once, then double that number and you now need 26cfm at 90psi. Choose belt driven, they are much quieter. Choose Oiled. Oil-less compressors are very loud and the pumps usually have a shorter lifespan. Cheaper air compressor motors will run at 3,450 rpm. If you can afford it, try to find an air compressor that has a lower rpm rating. They will produce less heat and are also quieter. Most all air compressors that you will find locally that are targeted at home use will have an rpm rating of 3,450. A 2-stage Air Compressor uses a pump with 2 pistons. The first piston will compressor the air to a certain psi and then send it through a cooler and then to another piston that will compress it to a higher psi. A 3-stage would use the same principle but with 3-pistons. A 2-stage air compressor is capable of outputting much more CFM than a single stage. If it is in your price range, a 2-stage air compressor is ideal for the home shop to ensure you have plenty of air. It is important to mention that just because an air compressor has 2 cylinders does not mean that it is a 2-stage air compressor. There are many single stage twin cylinder air compressors out there. Every powder coating gun (except for the Craftsman Powder Coating gun) relies on an air compressor as a source to propel the powder out of the gun and onto the part. Powder coating guns do not require a very big compressor at all. I have even heard of people using pancake compressors with their powder coating guns. Now, I wouldn't recommend going that small, but anything that is a step up from a pancake compressor should work. 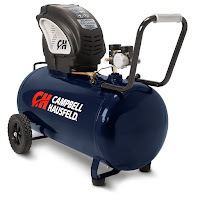 A 20 gallon air compressor like this Campbell Hausfeld DC200000 would be plenty for powder coating, blowing off parts, and doing other small tasks around the job and it will plug into your regular wall outlet. 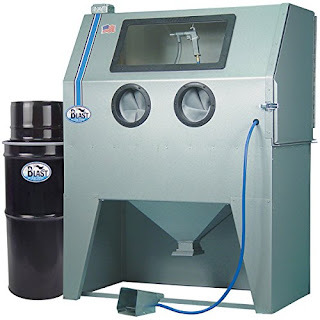 It won't produce enough air to do any real sandblasting but it is a nice mid-range compressor if you have a sandblasting alternative or if you outsource your blasting. You will use a compressed air blow gun a lot during the powder coating process. They are good for drying wet parts, cleaning your powder coating gun, and blowing off media after sandblasting. They are also great for lazily dusting the garage. The ideal blow gun for powder coating is one that uses a Venturi nozzle which puts out more air than the standard blow guns. Because these are not a continuous use tool when powder coating, meaning your not going to be blowing something off for 20 minutes, almost any compressor will operate it. However, a little pancake compressor will run until you let go of the trigger. A sandblaster uses a LOT of air. If you plan to do your own blasting, you will want a larger compressor. The only way you would get by with a smaller one (and by smaller, I mean a 30 gallon) is if you only plan to blast very small parts and not a lot at one time. I feel the bare minimum for blasting is my own compressor which is a 60 gallon, 11cfm@90psi, 4.4HP compressor. It will keep up with my siphon sandblaster and is actually able to shut off while I am still blasting, but I like to give it breaks because once it does kick on and start to run, it takes about 5 minutes to shut off. Then it will start running again in another 5 minutes. The reason I give it breaks, is because it was not meant to run that much. Most of the time I sandblast small to medium sized parts like engine brackets so I don't mind the breaks that much. When I occasionally blast wheels, I wish I had a larger compressor. The compressor will have to cycle on and off about 10 times for each wheel, which equates to a lot of breaks. Another advantage of a large compressor when sandblasting, is the ability to use a larger sandblasting nozzle. The CFM a sandblaster uses largely depends on what size nozzle you are using. I use 1/4" nozzles. A small nozzle like that blasts a very small area at a time but it uses less than air than a larger nozzle. With a bigger compressor, you can step up your nozzle size and blast larger areas at a time which makes the whole sandblasting task go by much faster. Industrial sandblasters use a sandblaster that resembles a fire hose which they use to blasts ships and buildings, but they need monster-sized compressors to be able to supply enough air for them. What this whole article comes down to is that you need a compressor big enough to sandblast the parts that you plan on powder coating. You may think you have the patience to wait for a 30-gallon compressor to catch up while you are sandblasting a set of wheels. You may have that patience for the first set of wheels, but your patience will quickly run out as you continue to sandblast more and more parts. Buy a big enough compressor from the start so your time spent in the garage isn't miserable. It is worth the money. 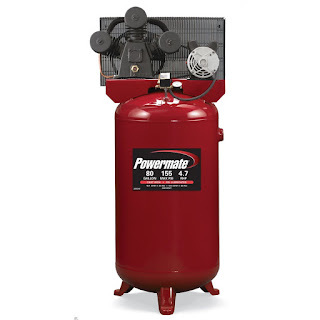 A 80 gallon single stage air compressor would allow you to get by but a 2-stage 80 gallon compressor would be ideal. In the next article, I will be discussing how to keep your compressed air DRY. Air compressor is a machine that takes air at atmospheric pressure and converts it into higher pressure or it is a tool that takes power from an electric diesel engine and converts into a kinetic energy. Air compressor is widely used in many plant and manufacturing industry. Apart from it, they are also used in home workshops, in automobiles industry, in concrete repair, basements and garages. There are several types of air compressors available with different features and cost. Before buying an air compressor, you have to ensure about the air tools that you will be using. You can visit this http://www.mwhire.com/equipment/equipment-categories/airtools-compressors/equipment-status/for-hire/ to get many model in air compressors. Love the site. Well done. Hope you don't mind if I add a note on compressors you might include for the reader, in case they get duped in the tool shop .... when buying a 2 stage, Two cylinders does not necessarily mean 2 stage, unless, the second is half the size of the first (usually diameter), or, if there are three the same size - two should feed into one. In short it must 'half' the volume of air with each stage. Multiple cylinders of the same size are still single stage. Thanks, I will edit the post and ad that bit of information. No problem at all, thanks for reading. Thank you for sharing some useful tips how to choose an air compressor. It's a really informative blog I have ever seen. 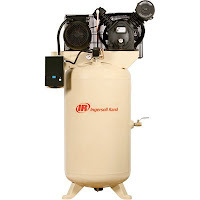 To make sure that you get the best air compressor there are some things you need to look for. Manufacturer’s warranties are important, even on a well known brand. Customer reviews and ratings can also help you get a good idea of how well an air compressor performs. Yeah that is good advice, I always recommend going by customer reviews when shopping for anything. I'll add your extra advice to the article. Before I read this article, I was a novice when it comes to air compressors but now I know exactly what to look for. Very helpful article even for a novice like me. Thanks Sean! And another thanks for Greg Blake there with his very useful comment about the two stage compressors. This could be very helpful to us.Thank you for Sharing,That is what I really need. I like and understand fully your topic and bookmark it for future post of you. wish you allsharing nice info . 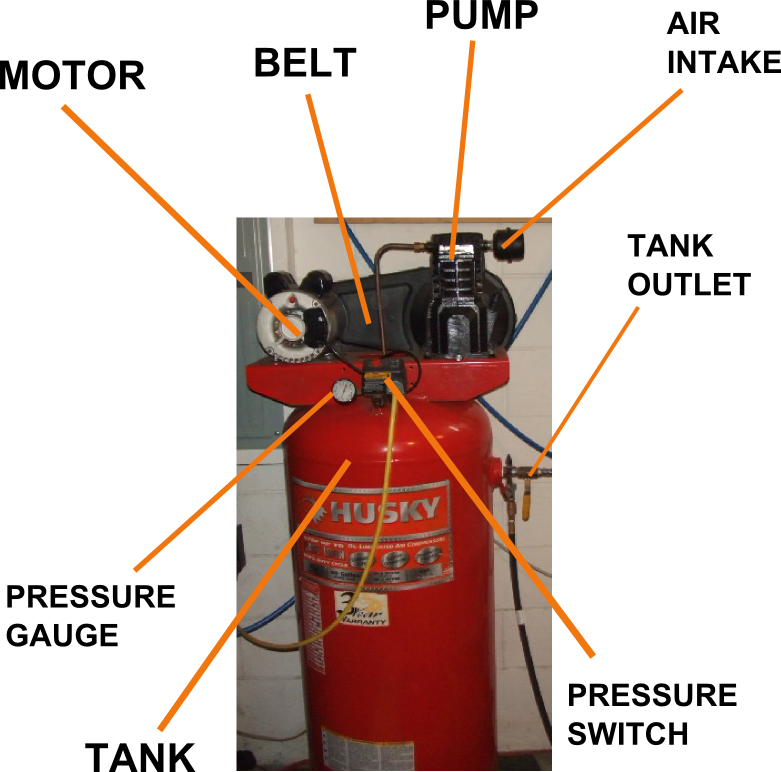 Follow any of the steps in my article "How to Dry Compressed Air" and you will be able to protect your air tools from rust. There is no need to drain the tank completely after each use. Just let the accumulated water out of the bottom of the tank before and after each use. You only have to open the valve for a couple of seconds and the water residing in the bottom will spray out. However, this alone is not enough to protect your air tools. You will need some kind of water removal method inline before your air tools. You will want to find an oil-less air compressor with a low rpm motor. A lot of air compressors run at 3450 RPM's and they produce a lot of noise. There are some compressors that can run as low as 400 RPM and these will be much quieter. Once you have purchased the air compressor, you can plumb the inlet filter from the air compressor outside of the home, however then it will be loud outside. If you have neighbors, this may not be the best bet. The other option is a muffler between the air compressor and the air filter. Google search "air compressor muffler" to see your options. That's exactly what I needed to know as well. 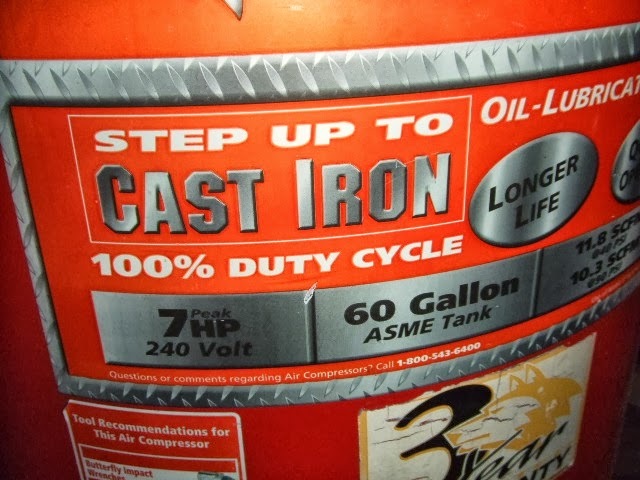 Getting into the powder coating but the wife is concerned about the noise and association complaining since we live in a condo complex. I'm sorry, after rereading my comment I realize I said oil-less . That is not what I meant to type as oil-less compressors are much louder than oiled compressors. Great blog and fantastic review! Short and powerfull! Thanks for sharing. How long air tools can run before the compressor turns back on depends on the size of a compressor’s tank. Hencethe size of a compressor’s tank is of utmost importance .Tank sizes are rated in gallons, and run from 1 gallon all the way up to 80 gallons. However bigger size means more money and added to it, portability is an issue. Air compressors with big tanks are generally stationary. You are right, they are very addictive! Once you have a goo strong supply of air piped all around your workshop, you tend to take it for granted, and if the compressor goes down, you wonder how you can live without it. Exactly! I moved a couple of years ago and didn't have my compressor up and running for about a month. I didn't realize how much I used it until I couldn't use it. If you caculate the HP follow: HP = AmpxVolts. Almost motor of compressor is used one phase voltage, but in US use the voltage resource 120v. After that the HP that is used 120v is equa 1/2 HP what is used 240v. is that right? This is really informative and helpful especially those who are just starting out! I think the photo with the parts label is a great touch to it, too! Wow! Just a great info. Tomorrow I'm going to buy portable air compressor, I think your tips will help me to to choose the right tool. Thanks an advance.